A blend of chlorinated phenols, castor oil soap and pine oils and solvent in aqueous solution. This product is effective against a wide range of gram positive and negative bacteria. Directions: For general mopping and hard surface disinfection dilute 1 part to 60 parts water. Use neat on toilets and drains. This product is available in 1, 5, 25 and 200 litre plastic containers. A viscous hypochlorite solution which clings to vertical surfaces. Removes slime and fungi, eradicates malodours at source. Contains advanced wetting agents for total cleaning. Keeps drains and toilets clean and bacteria free. Thick bleach is effective against a wide range of pathogenic organisms. For general cleaning use 1 part to 80 parts water Use undiluted on toilets and drains. 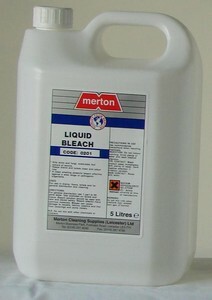 Bleach solutions should be used with care and stored safely. Bleach attacks many common materials and misuse can cause damage to carpets, fabrics, plastics and lino and some metals. Description: A product which kills slime and fungi and eridicates malodours at source. It keeps drains and toilets clean and sweet smelling and is effective against a wide range of bacteria. A concentrated product that can be used in drains and toilets and on floors and for general disinfection and cleaning. Directions: For general disinfection dilute 1 part to between 40 and 80 parts water depending on concentration. 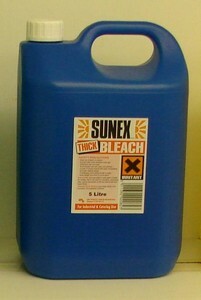 Bleach solutions should be used with care and stored safely away from direct sunlight and in a cool dry place. Bleach attacks many common materials. misuse can cause damage to carpets, fabrics, plastics and some metals. Do not mix with other chemicals or cleaners. Keep away from acids. This product is supplied in 1, 5, 25 and 200 litre plastic containers. At above 5%bleach content the product has to be supplied in UN specified packaging for transport purposes. Description: Formulated for industrial and enviromental use. 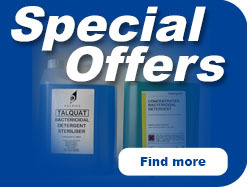 Neutralises offensive odours in drains and settling tanks. Has low toxicity and is safe to use yet effective in nursing homes. An effective product for masking odours and killing bacteria. This product finds use in a variety of applications including: refuse tips, dustbins, sewerage farms and offal treatment plants. Also for eliminating offensive odours from geriatric and incontinent patient care. Directions: In general use spray effected area with a solution in water (up to 1 part to 80 parts water). Always spray at the source of the odour. This product is available in all sizes of container and pakaging types. Description: Clean citrus odour suiable for all areas. Penetrates and disperses soil enabling effective disinfection. More versatile then pine disinfectant. Description: A clean smelling disinfectant which can be used to treat broken skin ie cuts. It can be used in other ares with a maximum dilution of 1 part to 60 parts water. The finished product is DHSS approved for chloroxylenol content and conforms to British Standard 541. It can be diluted up to 1 part with 60 parts water and still meet the requirments of BS5197. Dilution with water forms a white emulsion. For cuts, bites and stings dilute 1 part to 6 parts water. For bathing babies or laundry applications dilute 1 part to 5 parts water and for mopping floors dilute 1 part to 50 parts water. This product is available in 1, 5, 25 and 200 litre plastic containers. Description: A powerful and effective disinfectant with Rideal Walker coeffecient 5-7. Ideal for dirty conditions, the killing power overcomes dirt and contamination. A strong coal tar smell eradicates foul odours in drains and sewers. The product is highly concentrated and economical to use. It conforms to BS 2462 and is ideal for use in pet areas. It is effective against a wide spectrum of bacteria including salmonella, E-coli and shigella dysenteriae. Directions: For general mopping and hard surfaces dilute 1 part to 100 parts water. For spray application dilute 1 part to 120 parts water. Use neat on toilets and drains. This product is available in 1, 5, 25 and 200 litre plastic containers. 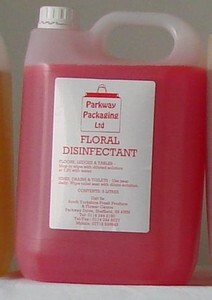 Description: A general disinfectant for schools, offices, factories, canteens, clubs, resaurants and hotels. 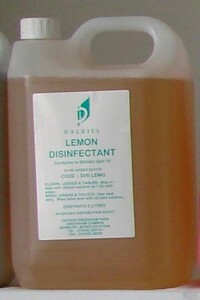 Description: A fresh lemon fragranced liquid which provides an effective sanitising action. It is safe on hands and eliminates unpleasant odours. Description: Clean floral odour is suitable for most areas. Penetrates and disperses soil to enable effective disinfection. Safe on fabrics and floors. 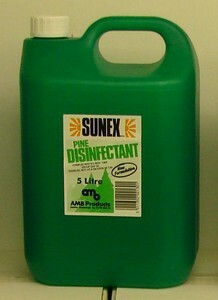 More versatile the pine disinfectant.